I’m old enough to have seen how sushi (not to mention sashimi) has undergone a complete transformation over the decades in its image and acceptance outside the community. From my own observation, sushi has for the past 15-20 years been considered, if not haute cuisine in the traditional French sense (since it’s Japanese in origin, not French), high-end, high-art cuisine, sophisticated as any “continental” style dining. Yet I’ve also heard toddlers in L.A. supermarkets implore their moms to buy them the plastic-packed “shoo-shi.” I’ve heard health-conscious teenage girls ask for it because it’s considered healthy. I’ve seen grown men bring dates to their favorite sushi bars to interact with Masa or Takeshi behind the counter to show off their expertise and thereby impress their prospective love interests. I’m not sure how it is in “flyover” country, but here in Southern California and elsewhere along the West Coast, sushi now has a following that goes way beyond the Japanese American and Japanese expat communities. Hopefully, even in landlocked areas of America, acceptance of sushi has risen. It was not always thus. I still wince when I remember how “raw fish” was an automatic laugh-getter for standup comedians. (“You call it sushi. I call it bait.” Ha ha ha.) Now documentaries like “Jiro Dreams of Sushi” (which I just watched streaming on Netflix) add status to a cuisine that once was a joke. Somehow, somewhere, it changed, just like “Made in Japan” went from a codename for “junk” to “well made.” And that, my friends, is a good thing. In that way, sushi’s acceptance is analogous to how views of Japanese Americans have steadily risen since WWII. As sushi has gone from “weird” to “beloved,” so too have gone people of Japanese heritage in this land of ours. And yet, like a movie based on real events that race-changes the principal characters to white from Asian or, like the recent “Emperor,” which ignored Nisei MIS who served in the U.S. occupation of Japan, when it comes to sushi, we don’t quite get explicit credit. 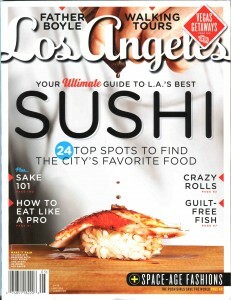 Take the cover story of the current issue of Los Angeles Magazine. But the other thing that immediately struck me was the credit given to the invention of the California roll. If there is a singular representation of the fusion of traditional Japanese sushi and Yankee ingenuity arising from being freed of the strictures of Japanese society — California rolls not being native to Japan — it is this delicacy. The magazine credits Ichiro Mashita for its invention in 1967. But, as mentioned in my May 12, 2011 column, entrepreneur and author Mari Kimura wrote in her memoir “Fish & Fashion” that it was her father, Tadao Kimura, who invented the California roll in the 1950s. Her father came to the U.S. from Hokkaido, where he grew up eating crabs. Before he and his wife, Kyoko, became the first Japanese to found a company that specialized in producing TV commercials in the U.S. for the Japanese market, one of the first jobs he had when he arrived was as a landscape gardener. It was under these circumstances where he discovered the avocado, which is not native to Japan. It was, as they say, love at first bite. Kind of like the Reese’s Peanut Butter Cup, which combined two favorites into something new, Tadao Kimura was thus inspired to combine the two foods he loved. In other words, Kimura was the inventor and architect of the California roll, not unlike Frank Lloyd Wright, whose buildings everyone remembers, with no one remembering who the builders of his famous structures were. Unlike Wright’s case, however, the architect of the California roll seems to have been forgotten. “The thing is this. Some people claim that they made it, but there’s no history as to why they came up with the combination of the avocado and the crab,” said Kimura. Her father’s unique background — coming from crab-abundant Hokkaido and working as a gardener where he learned about the avocado — seems convincing to me. I suppose that I’m opening up a can of crabs with this assertion — but let’s see if anyone can refute Mari Kimura’s story about the origin of the California roll. Meantime, all that research may make you hungry for sushi, whether it’s the California roll or something more traditional. 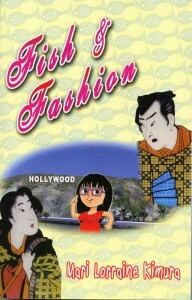 While you’re eating, you might want to read “Fish & Fashion,” which is a lot of fun. It can be purchased at www.FishAndFashion.com, or Amazon.com. It’s also available as an e-book.